Wow! 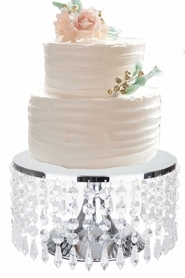 So exquisite and gorgeous, our "Cameron" Crystal Beaded Dessert Table and Centerpiece Riser is one delicious piece of eye candy! 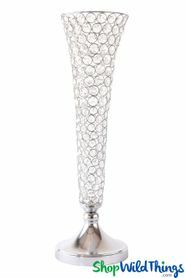 This multi-purpose wedding and event décor item stands 19 1/2" tall, 23 1/2" long, 11 3/4" wide and is dripping with 78 strands of crystal beads. 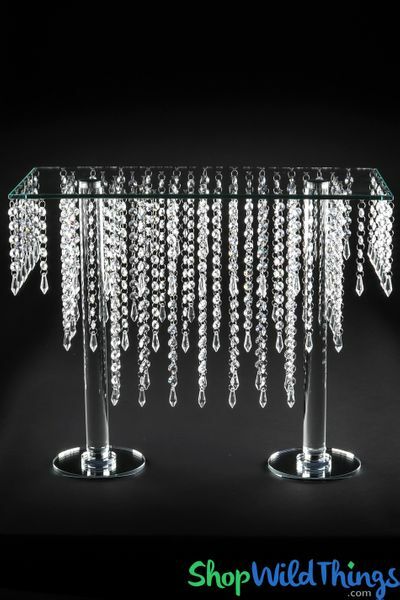 The mirrored bases are 6 1/4" in diameter and support 2, crystal clear columns which support the glass top table which is a substantial 5/16" thick. Under the table are 3 tiers of faceted crystal beaded strands that sparkle intensely with minimal light. Cameron weighs just under 19 lbs. so you can rest assured that this table riser is one quality item you can absolutely depend on. Our crystal beads are real crystal, not acrylic and they are faceted on all sides. You will find sellers who "sneak" in plastic beads or mix acrylic with glass beads. We are fanatical that this is NOT done on our products and we are very proud of our line of real crystal beaded products. When photographing and trying to describe this piece, we seriously had difficulties capturing just how magnificent this table riser is. It is absolutely stunning, and we tried to do it justice but words and a camera simply cannot translate the true beauty of Cameron in real life. The crystal bead strands attach under the tabletop. There are 16 strands at 14" long for the innermost tier, 26 strands at 9 1/2" long for the middle tier and 36 strands at 5 1/2" long for the outermost tier. Perfectly perfect for weddings, events and black-tie affairs, use Cameron to show off a wedding cake, treats and desserts, appetizers and drinks or party favors. 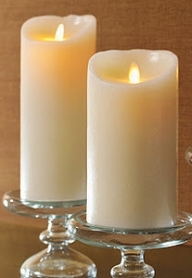 Create a focal point by using nothing but candles of varying heights or use candles and pictures. Another impressive display is to use Cameron to hold a candelabra, a Small Manzanita Money Tree, a money box or card box. Elevate centerpiece décor like crystal beaded crowns and candle holders, Tall Latour Vases or top with another crystal riser for a multi-tiered display. There is a 2" wide area around the mirrored base where you can place Mini Votives in Glass Cups to increase the sparkle factor! Truly a multitude of uses for this extraordinary table and riser. All that's left to say is, ENJOY!